This project has been on my mind for a long time. But I purposely waited to begin until I could weave it on my new sweet little loom with a view. 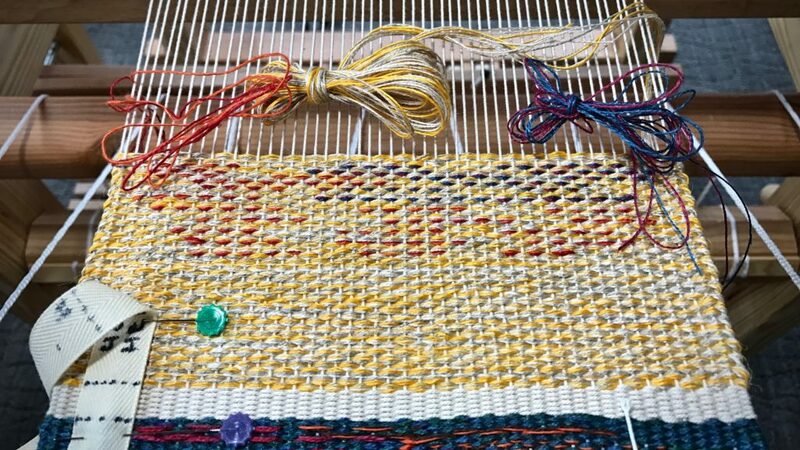 Four Decorative Sample Strips, it’s called in The Big Book of Weaving, by Laila Lundell. It includes four-shaft tapestry, as well as weft inlay techniques. Each of the four strips will be a sampling of 8-12 different patterns or techniques. The weft is all linen, in various colors and sizes. Several strands are bundled together and made into butterflies. I have the sections mapped out, but the actual designing is happening at the loom. Box of linen! A variety of 16/2 line linen, 6/1 tow linen, and 8/1 tow linen. First sample strip starts with some weft inlay. 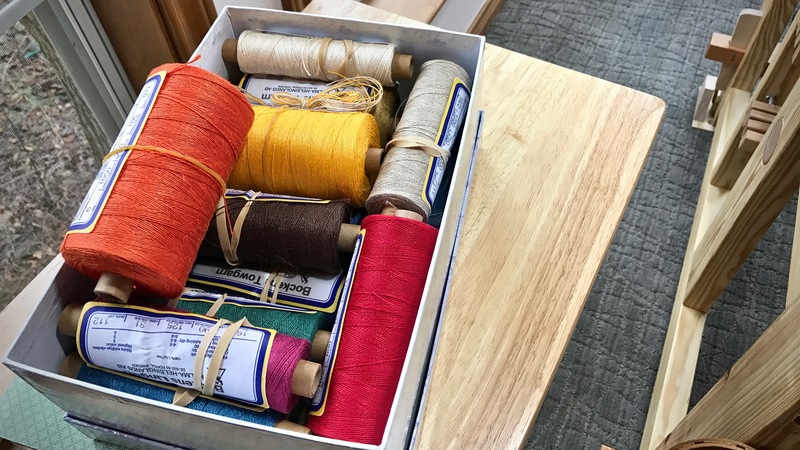 The box of vibrant shades of linen that sits by the loom makes me think of the wonderful colors in creation. The Grand Weaver puts an assortment of strands together, making something as only He can. The world belongs to its Maker. We are His. Sometimes we forget that it is not that He is in our universe, it is that we are in His. I love the way He puts an assortment of us together to put a splash of color on His tapestry. May you enjoy the colors around you. Can’t wait to see the tapestry He weaves!! Hi Melissa, His tapestry will be like nothing we’ve ever seen. I’m sure he has colors beyond our imagination. Beautiful colors, can’t wait to see what comes from them. I love you loom with a view! Thanks Liberty, Colors always seem more alive to me in linen. I’m glad I get to take my time with them and enjoy the scenery, too! 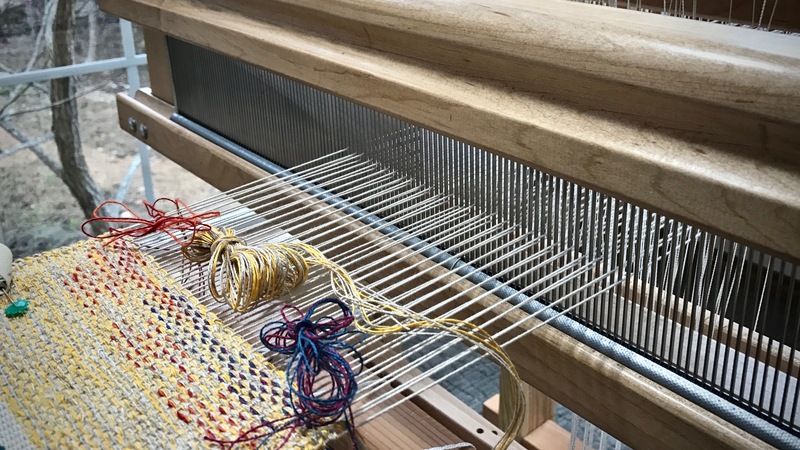 Hi Marjorie, Welcome to the wide wonderful world of weaving! And welcome here in this corner of the weaving world. That Lundell book will step you through everything you need to know to dress your loom and make something beautiful. I’m excited for you! Let me know if there is any way I can help you along the way.